The Russian Admiral Kuznetsov aircraft-carrying cruiser returned from Syria and entered the Kola Bay near the country’s northern port city of Severomorsk on Wednesday, the Russian Defense Ministry said. Residents of Severomorsk gathered at the city’s main square to welcome the carrier’s crew members, who have been on a mission in the Northeast Atlantic and the Mediterranean Sea since October 15, 2016. On Thursday, the crew members took part in the welcoming ceremony with the participation of representatives of the Russian Navy command, the Northern Fleet command and Murmansk region and Severomorsk city administrations. In October 2016, Russia’s naval group, consisting of the Admiral Kuznetsov, the Pyotr Veliky battle cruiser, the Severomorsk and the Vice-Admiral Kulakov anti-submarine destroyers, and support vessels, was sent to the Mediterranean. Since the group's arrival to Syria, the air wing based at the Admiral Kuznetsov had participated in Russia's anti-terror operation until January 6. On February 3, the Russian Defense Ministry said that the air wing of Russian aircraft-carrying cruiser Admiral Kuznetsov destroyed over 1,000 terrorist targets during its mission in Syria. “For the first time in the history of the Russian Navy, carrier-based aircraft conducted combat missions by launching strikes directly from the ship on terrorists' headquarters, control centers, groups of militants, hardware, firing positions and terrorist strongholds,” the Russian Defense Ministry said then. The Ministry added that naval aviation pilots carried out 420 sorties, of which 117 were carried out at night, as well as 750 missions as part of the search and rescue operations and transport support. Over 40 naval-based aircraft have participated in the mission. 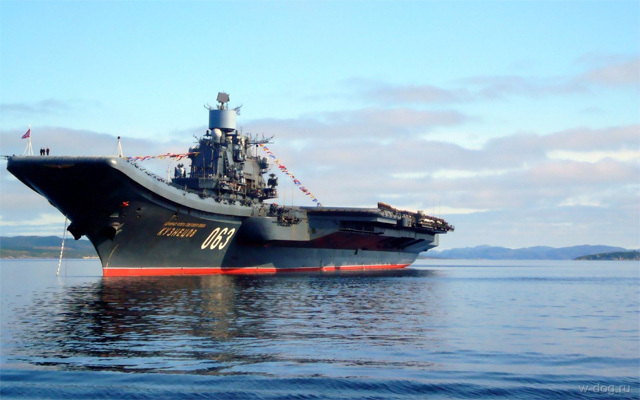 In January, Russia decided to reduce its military presence in Syria, starting with the pullout of a Northern Fleet carrier group led by the Admiral Kuznetsov.